Earlier this week the Census Bureau released data from the Current Population Survey (CPS) showing strong national income growth in 2015. State income data from the American Community Survey (ACS), which the Census Bureau released today, show similar results across the United States, with a 3.8 percent increase in real (inflation-adjusted) median household income for the country as a whole. This translates to an increase of $2,062 in the annual income of the typical U.S. household. (The ACS has a different sample and covers a somewhat different timeframe than the CPS, leading to slightly different estimates between the two surveys.) Real median household income increased in 39 states and the District of Columbia between 2014 and 2015. 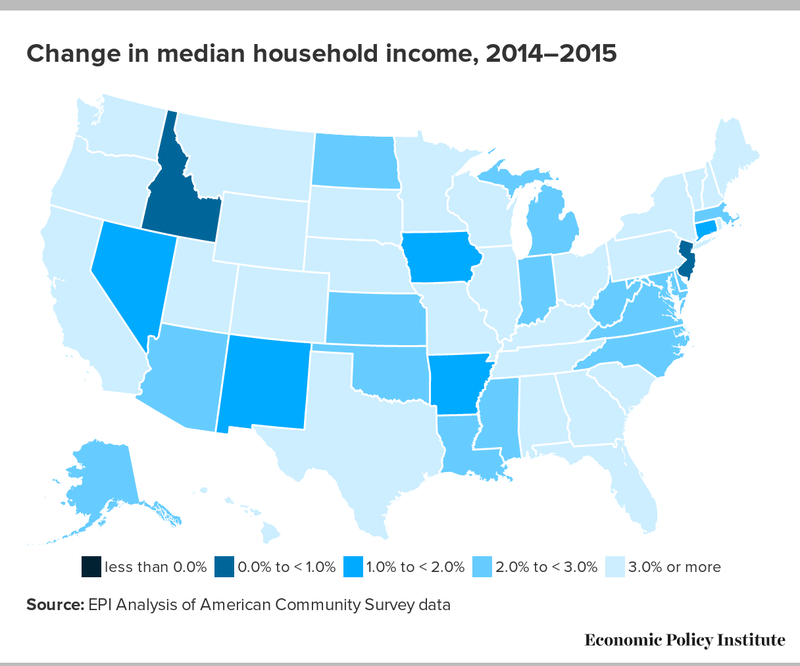 Between 2014 and 2015, the largest percentage gains in household income occurred in Montana, where the typical household income grew by $3,146—an increase of 6.7 percent. Tennessee (6.4 percent), Oregon (5.9 percent), Massachusetts (5.7 percent), Rhode Island (5.7 percent), Wisconsin (5.6 percent), Hawaii (5.5 percent), New Hampshire (5.5 percent), District of Columbia (5.4 percent), Wyoming (5.4 percent), Kentucky (5.1 percent), and Vermont (5.1 percent) all had increase of 5 percent or more. In 11 states, median household income was unchanged over the year. There were no states that had a statistically significant decrease in median household income. After years of wage stagnation, incomes have finally started to recover. The labor market recovery in 2015 included lower unemployment, more hours of work, and strong inflation-adjusted wage growth. Despite increases in 2015, it’s worth noting that income levels in most states are still lower than they were before the Great Recession. Only 11 states (Colorado, Hawaii, Iowa, Nebraska, North Dakota, Oklahoma, Pennsylvania, South Dakota, Texas, Wyoming, and Washington) and the District of Columbia had median household incomes higher in 2015 than they were in 2007. And in 25 states median household incomes in 2015 were still lower than in 2000. While states are starting to see real improvement in living standards, policymakers at every level of government should continue to prioritize policies that will raise America’s pay.